Ryanair will base two additional aircraft at Luton next summer and launch six new routes from the airport to Alicante, Athens, Barcelona, Bologna, Cork and Malaga. 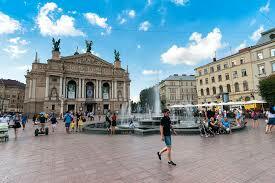 It will also offer new flights from Stansted to Kiev, Lviv in Ukraine (pictured) and Nantes. It total, it will operate 23 new routes from airports in the southeast next summer, including 14 from Southend to Alicante, Bilbao, Brest, Copenhagen, Cluj in Romania, Corfu, Dublin, Faro, Kosice in Slovakia, Malaga, Milan, Palma, Reus and Venice. The airline said it had had put 26 million seats on sale from Stansted, Gatwick, Luton and Southend for next summer, despite its fears that flights between the UK and Europe could be grounded from March when Britain leaves the EU.